Jaden Ivy sets the ball over the net during Saturday's sectional championship game against Bucyrus. The Lady Tigers claimed the sectional title, defeating the Lady Red; 3-2. The Lady Tigers Gracie Groves attempts the kill during Saturday's sectional championship game against the Bucyrus Lady Redmen. It took all five sets, but Galion will move on to the district semifinals to play Crestview. GALION — On Saturday night, the Galion Lady Tigers volleyball squad welcomed the Bucyrus Lady Redmen to town for the sectional championship match of the Division III Attica District. It took five sets for a champion to be crowned, but the Lady Tigers defeated the Lady Red to advance to the district semifinals; 3-2. Galion improves to 17-6 on the season with the victory and Bucyrus’ season ends at 11-13. The first set of the night went to the home team; 25-20 and contained seven ties and five lead changes. Both teams began the match trading kills back and forth before Jaden Ivy served up the first ace of the evening to give Galion their first lead at 3-2. Bucyrus would benefit from Galion’s unforced errors in the first set, as well as the remainder of the match, to keep the action close. After the jostling back and forth, the first set would conclude on a Lady Red service error to put the Lady Tigers up 1-0. Galion jumped out to a promising 6-0 start in the second set before Bucyrus was able to get on the board. That, however, would not stop the Lady Red from storming back and tying the match at nine apiece before posting a 9-0 run. With the visitors thriving, Samantha Comer would throw down a kill to stop the rally to make the score 18-10. More back and forth would occur and it would eventually be a set victory for Bucyrus; 25-16. With the match knotted up at one set apiece, Bucyrus would start the third set how they finished the second, eventually forcing Galion to call a timeout after opening up to a 9-2 lead. The Lady Tigers would attempt to claw their way back, but would find themselves down 15-7 at one point in the third. In a match that proved to be full of runs, the home team would score six unanswered points thanks to the serving of Kasidee Sinclair to pull to within two points; 15-13. Bucyrus proceeded to finish the third set on a 10-2 run to gain the victory; 25-15. The Lady Tigers stood face-to-face with elimation heading into the fourth set on Saturday. Bucyrus would start things off with a 1-0 lead, but that would prove to be the last time the visitors were ahead. After tying things up at one point apiece, Galion surged out to a 9-2 leading, forcing a Lady Red timeout. Bucyrus would not go quietly though and would eventually cause a Tigers’ timeout with the score at 15-14. The one-point deficit would prove to be the closest that the visitors would get as Galion would hold strong and force a fifth and deciding set by winning 25-21. In the fifth set, it was all Galion. Nicole Thomas got the scoring started by serving up an ace and would propel the Tigers to a 4-0 before Bucyrus tallied a point. The momentum would not shift and the home team stretched their lead to 11-4. Galion would only allow two more Lady Red points before finishing off the game and claiming the sectional championship on an ace from Kate Schieber to give the win to the Lady Tigers; 15-6. 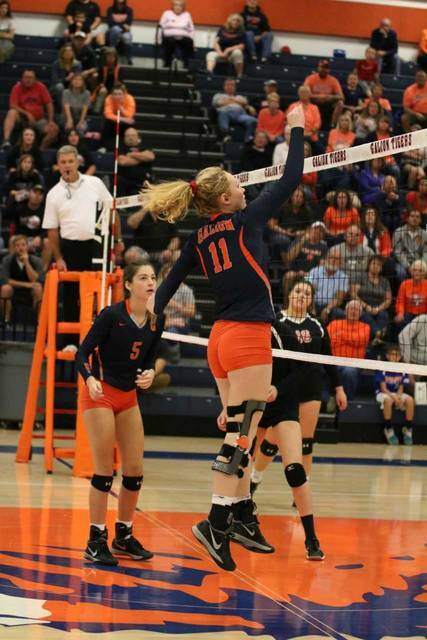 Serving statistics for Galion on Saturday were: Team- 86/95, 52 points, 10 aces; Thomas- 17/21, 13 points, 4 aces; Schieber- 22/22, 13 points, ace; Sinclair- 14/15, 11 points, 2 aces; Kayla Hardy- 13/15, 8 points, 2 aces; Ivy- 14/15, 7 points, ace; Abby Foust- 5/6 and Marisa Gwinner- 1/1. Offensive stats for the Lady Tigers were: Team- 147/172, 45 kills; Gwinner- 42/46, 20 kills; Ivy- 32/38, 13 kills; Comer- 13/17, 5 kills; Sinclair- 35/41, 5 kills, assist; Gillian Miller- 14/18, 2 kills; Hardy- 5/6 hitting, 118/121 setting, 38 assists and Schieber- assist. 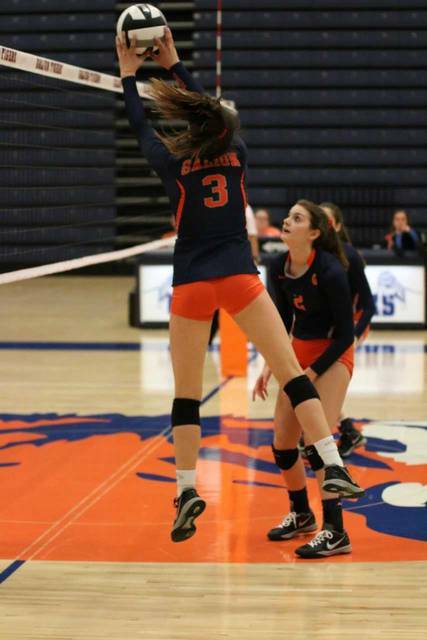 Defensive stats for Galion: Team- 73/74 service reception, 5 solo blocks, 8 assisted blocks, 77 digs; Miller- 5 blocks; Comer- 3 blocks, 4 digs; Gwinner- 3 blocks, 11 digs; Ivy- block, 12 digs; Gracie Groves- block; Hardy- 8 digs; Schieber- 8 digs; Thomas- 16 digs and Sinclair- 18 digs. The stage is now set for the Attica District semifinals. In the top portion of the bracket, it will be the No. 1 seed Huron Lady Tigers against the No. 4 seed Western Reserve Lady Roughriders at 6:15 p.m. on Wednesday, Oct. 25. The No. 2 seed Galion Lady Tigers will take on the No. 3 seed Crestview Lady Cougars immediately following the first game. These two contests will be held at Seneca East High School, located at 13343 US-224 in Attica, 44807. Jaden Ivy sets the ball over the net during Saturday’s sectional championship game against Bucyrus. The Lady Tigers claimed the sectional title, defeating the Lady Red; 3-2.
https://www.galioninquirer.com/wp-content/uploads/sites/38/2017/10/web1_Jaden-Ivy.jpgJaden Ivy sets the ball over the net during Saturday’s sectional championship game against Bucyrus. The Lady Tigers claimed the sectional title, defeating the Lady Red; 3-2. The Lady Tigers Gracie Groves attempts the kill during Saturday’s sectional championship game against the Bucyrus Lady Redmen. It took all five sets, but Galion will move on to the district semifinals to play Crestview. https://www.galioninquirer.com/wp-content/uploads/sites/38/2017/10/web1_Gracie-Groves.jpgThe Lady Tigers Gracie Groves attempts the kill during Saturday’s sectional championship game against the Bucyrus Lady Redmen. It took all five sets, but Galion will move on to the district semifinals to play Crestview.